Maine could be the first state in the country to give seniors and Mainers with disabilities the freedom to live at home with dignity and independence. 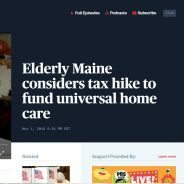 “Question 1” on the ballot would establish a universal home care program that guarantees in-home care services are available for all Maine families that need care, invests in the caregiving workforce, and supports family caregivers. How is it paid? Individuals who earn more than $128,400 will be subjected to a 1.9% tax on earned income above that amount and employers will also contribute 1.9% on earned income above $128,400. Maine has had other referendum fights in the past – in 2016, they passed a minimum wage hike, and increased public education funding by passing a tax increase on the wealthiest Mainers. But they’ve never seen a fight like this. Big business is united in their opposition – the real estate association, nursing home association, hospital association, among others are fighting this referendum they directly benefit when seniors have to sell their homes and move into nursing homes. And, they’re not getting a lot of help from Democrat party leaders who don’t want to ruffle big donor feathers or be seen to be raising taxes. This is a bold, exciting campaign and it could be modeled across the country. Watch this PBS segment for more information! Add your name to our petition that calls on the next Iowa Governor to create a Caregiving Advisory Caucus. Those most impacted by this issue should help craft policy, not just the industry associations. Like or Tweet to share this type of bold issue politics with your networks.